Things are still rather quiet on the Buglabs front. I have been very busy with release stuff at work, and the forum postings have been pretty thin on the ground. The community application count was still at four yesterday, and I posted two of those (and the other two are at least partially based on my two). There are 14 apps in total, but the others are from Buglabs directly. I don't know if it's that people didn't realize that beta-testing something like this would involve coding, or working with the emulator is just too intangible for them, or what. Some people have being having problems getting the SDK integrated into Eclipse but other than that I'd say it was going pretty smoothly for a beta. Perhaps when the actual Bug comes out the interest will pick back up. Once you've plugged the LCD and GPS modules into the bug, it will by default show you the to-do list whose location is nearest to your current position. I made it so that you could also explicitly select a list from a menu though. I posted it as-is, but I need to come up with a way of actually creating and working with lists. The bug doesn't have a keyboard, but an on-screen one could be created, iPhone-style. I've also considered exposing the lists via a servlet, but that would only be helpful if you had a 'real' computer to-hand; ideally you could work with lists directly on the bug. 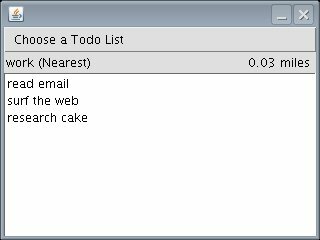 Another possibility in the less-than-ideal camp is to make it sync with web-based to-do list sites such as Remember The Milk or Ta Da Lists. I posted my thoughts on the forum, so I'll see what the buglabs folks and the other beta-testers think before going much further. I certainly don't fancy trying to create the on-screen keyboard myself in PhoneME's AWT.